Whaaaaa??? What’s this, a new page? I’m actually still drawing new pages?! I’m really sorry guys, for my my absence. Work has been particularly crazy (Q4 is always a bit hectic because clients are putting in last-minute requests), and the holidays are as you can imagine a bit nuts. But there are three more pages until the end of the chapter, and the end of this arc! And then, it’s time to print this bad boy! With luck, I’ll have paperback versions of the first five chapters for currently 5 conventions we have planned for next year! 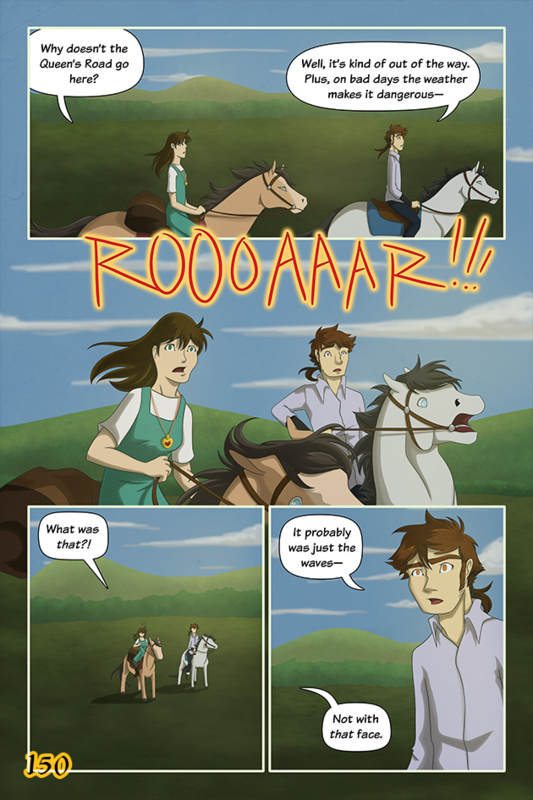 In any case, enjoy this page, next week’s page is already done a queued as well! PS: Something I’m unnecessarily proud of and feel the need to share — I drove down to Florida (from Connecticut) to see my family for the week of Thanksgiving. My previous best time (and longest continuous drive) was driving from Atlanta, GA to Stamford, CT in a day. It’s around 900 miles, I left around 7 am and arrived at 10:30 pm. Well, on the way back with my sister, I beat that by driving from Ft. Lauderdale, FL to Philadelphia, PA in one clip, from 8 am to 3:30 am the next day! Around 1,200 miles, in an amazing, awful, exhausting adventure of a day. In any case, enjoy the page, and happy holidays! With a face like that, who needs enemies? Sure, it’s just the waves, roaring with excitement…poor Shadow is just not a good liar. Ahahah, we all have our flaws, right?